Saute the shrimp, parsley, garlic, and the mushrooms in the butter. Simmer for a few minutes, then add the flour and let cook out. Add the cheese and finish with the milk. Season with salt and pepper. Serve over rice or pasta. This month we recorded 30 members and guests at our April meeting. The History Center recorded 53 visitors. The gift shop took in $81.94. The History Center was used by Got-‘em-on Live, the Frt Fisher UDC, The Pleasure Island Sea Turtle Project and a group of Sea Scouts for meetings. Please welcome new members John & Frances Mosley of Wilmington, Jerry & Francine Hall of Carolina Beach and Louinice and Donald Motsinger of Winston-Salem. Also please welcome new business member Winner RV Park of Carolina Beach. Also Tommy King of Wilmington is now a personal member. Oh, and thanks to Jay Winner for renewing as a lifetime member! THANKS TO ALL! Thanks to Jeannie and John Gordon, Juanita Winner, Sylvia Snook, Ron Griffin and Demetria Sapienza for keeping the History Center open while Rebecca was on vacation! Thanks to our History Center Volunteers Carl Filipiak and Ron Griffin for working on the cataloging of the subject files. That project is finally beginning to move ahead..
Just below the cement gates to Ft. Fisher was water. The Air Force base was a training base. The parade ground was right when you come inside all those houses. On the other side of the parade ground is the river. In between was the barracks and the chow hall. Big guns were on the beach for target practice with targets off shore that the naked eye couldn’t see. The Army had a blimp that flew over the Ft. Fisher area for a spotter. There were target practices for big guns. The blimp would sit up there and tell the military where the shells went. It’s out of sight so you can’t see it from shore; but the blimp sitting up there could see them. They had a USO on the Air Force base grounds. Southern Bell would send them down. Starting in 1946 you couldn’t do anything until the Army got out. 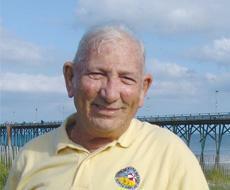 The Orrell Brothers owned the pier—all of Ft. Fisher. The Orrell Brothers hired Earl Walter Winner as a building contractor. Earl stayed down there because there was so much to do. The Army knew they weren’t going to keep the place and spend much money on something you’re fixin’ to leave. Earl Page cleared sand off Fort Fisher Parking lot. 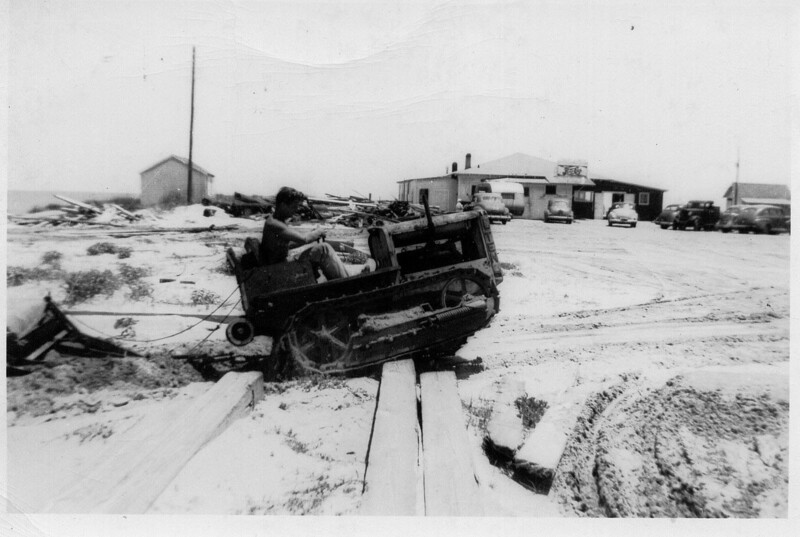 Earl would grade the roads and put down boardwalk to each cottage so you didn’t have to get in the mud to go fishing. The Ft Fisher pier was further south. Blue Top was up near the post. We had the pier and there were 8 cottages around the pier. People would come and stay at the cottage and go out on the pier and fish. 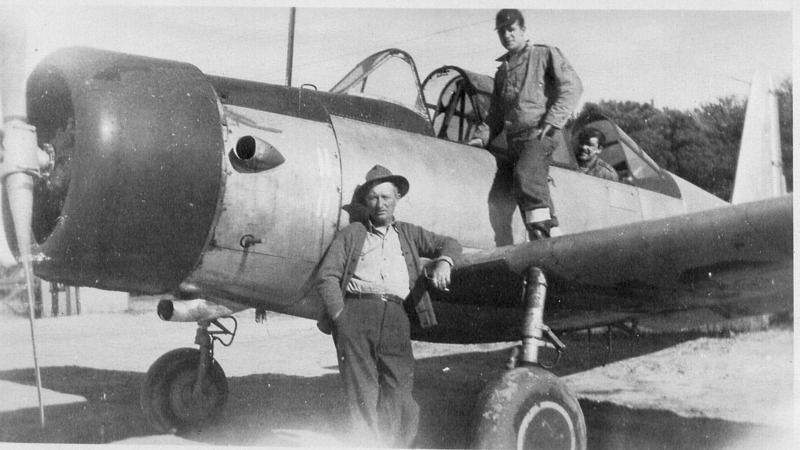 Airplane: This is a BT-13 plane, an Ex-Army air-force. This airplane is sitting right where the museum is at Ft Fisher. When you walk in the front door of the museum and walk out the back door, you’re looking right down the airstrip. The pilot is a friend of Earl Page and the other is Earl Page’s father. It’s great to report that we are receiving funding from both Carolina Beach and Kure Beach for the operation of the History Center for the 2013/2014 budget year. That will go a long way in helping us balance the budget for another year. Please take time to let your elected political official how much we appreciate their ongoing support. Our annual elections will be held at the July meeting. The nominating committee has been hard a work on the new slate of officers and board members. Nominations will be announced at the June meeting and listed in the July Newsletter. On Sunday May 19 forty-one people boarded Wilmington Water Tour’s cruiser the Wilmington for a Black Water Adventure up the Cape Fear from Wilmington. From all reports this was a great event with masterful narration by Doug Springer, former Cape Fear Riverkeeper. A huge thanks to Doug and Diane and the whole staff at WWT for the smooth and seamless event. Plans are already underway to do another in the fall. 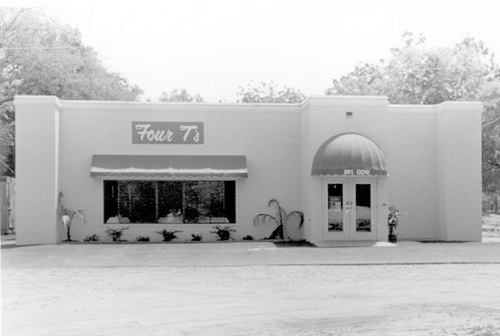 The Federal Point Historic Preservation Society held its monthly meeting on Monday, May 20, 7:30 pm at the Federal Point History Center, 1121-A North Lake Park Blvd., adjacent to Carolina Beach Town Hall. Local historian, author and publisher Jack Fryar talked about the Revolutionary War period here in the Lower Cape Fear. 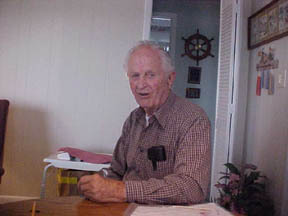 Jack is the author or editor of twenty-two books about the history of the Cape Fear and North Carolina. 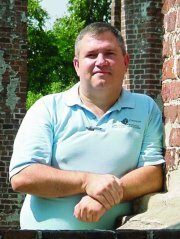 Jack is the publisher of Dram Tree Books, the local press specializing in books about the four centuries of history of the Tar Heel State, particularly the coastal regions. He lives in Wilmington with his wife, Cherie, and is currently working towards a Masters in History at UNC-Wilmington. The always knowledgeable and informative Jack Fryar talked about the run up to the Revolutionary War in the Lower Cape Fear. He actually explained the “Regulators” rebellion and the events at Moores Creek Bridge where loyalists fought revolutionaries in a way that was comprehensible. He also promised to return for another meeting were he will talk about the conclusion of the way, again with local emphasis. For those who want to learn more he suggested the book Redcats on the Cape Fear by Robert Dunkerly which was originally published by Dram Tree Books but has been revised and was reprinted by McFarland Press in 2012. Also suggested for understanding this period, particularly the issues for the Scottish immigrants, were the historical novels in the “Outlander” series of books by Diana Gabaldon as Jack served a historical consultant to the author particularly on books 4 and 5.